When Gordon Bunshaft of Skidmore Owings & Merrill designed a sloping skyscraper at 9 West 57th Street its façade design was rejected by developer Sheldon Solow but it was taken over for the building at 1114 Avenue of the Americas. Bunshaft designed a sleeker façade, albeit with pretty much the same form, for Solow and it become one of the most famous buildings in midtown. Richard Gluckman of Gluckman Mayner Architects, who achieved fame for designs for high-profile art galleries in Chelsea and retail spaces for designers including Yves Saint Laurent, designed the rippled façade for this project and it is likely to be imitated for it adds a lyrical, if not poetic, element to the urban fabric, particularly at this location on the eastern boundary of SoHo and the fringes of NoHo. "The Lafayette Street façade is composed of alternating horizontal bands of brick & glass on an undulating curve that shifts at every floor. The banded brick is reminiscent of the old warehouse buildings that are part of this part of the city. The brick on the front facades is a textured iridescent gray. At different times of day, the brick will appear to change color, from a silvery sheen to purple gray, to black. The rough 'artisan' texture is intended to animate the façade. The continuous aluminum windows are eight feet high. The windows on the street facades are triple-glazed with laminated glass to provide an acoustic separation from the street. A vertical notch in the building's north and south faces splits the building in two. While the front half of the building is rendered in the gray brick described above, the volume of building facing the rear courtyard is rendered in a silvery red brick with a smooth velour finish. The rear/West façade of the Lafayette St. building is composed of a seemingly random mix of punched openings. The pattern however is the result of a formula in which every living room has at least 3 windows and every bedroom has at least two windows." 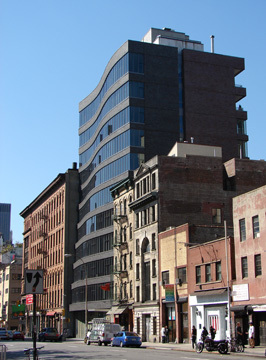 This project is several blocks south from One Astor Place, a sinuously curved glass apartment tower designed by Gwathmey Siegel Architects about the same time as this project. Because it is a free-standing tower in a more prominent location, comparisons with One Astor Place, however, are unfair. This "undulating" façade is subtle rather than flamboyant. It is not going to challenge the wild gyrations of Frank Gehry's recent buildings such as the Guggenheim Museum in Bilbao, Spain, which was, undoubtedly, a distant influence. "The entrance to the building...is flanked on either side by piers that are wrapped in textured gray 'Pompeii' lava stone. A canopy clad in anodized aluminum runs the length of the lobby and through the door. The lobby walls and floor are clad in the textured gray 'Pompeii' stone, cut in long, thin planks. The same stone comes in from the outside to the inside of the lobby on the floor and the walls. In the center of this linear space two volumes are shaped from the same material. One is a long and low volume that can function as a bench and the other a tall and wider volume that conceals the mailboxes behind. A twelve-foot-high wave of pale blue resin runs along the length of the north wall - mimicking the same curve at the front façade." Elevator cabs will have rounded corners on all sides and ceiling -"surrounded by a translucent red/orange plastic surface, smooth to the touch," the website tantalizingly noted. The building will have a 24-hour doorman/concierge and video surveillance. It will also have storage lockers in the cellar and a fitness center. Kitchens are equipped with Miele, Thermador, Bosch and Sub Zero appliances with stainless steel finishes and white carrera marble countertops with gray veins. Kitchen cabinets are finished in gray lacquer. All apartments have Bosch washer/dryers. On floors 2 to 8, ceilings of the main spaces of apartments are 10-feet-three-inches high. On floors 9 and 10, ceilings of the main spaces at 10-feet-high. In the penthouse apartments on the 11th floor, the ceilings are 12-feet-high. Apartments range in size from 450-square-foot studios to 1,400-square-foot, two-bedroom units. The original architect, Jean Nouvel, was replaced by Gluckman, whose other notable projects include the Dia Center for the Arts in New York, the Andy Warhol Museum in Pittsburgh, the Mori Art Center in Tokyo and the Georgia O'Keeffe Museum and Study Center in Santa Fe. Its location, overlooking a small triangular park, is convenient to Little Italy and very close to the great former Police Headquarters Building that was converted to apartments and to Café Roma, which has memorable cannolis. Kenmare Street turns into Delancey Street at Bowery and Delancey Street runs into the Williamsburg Bridge. This 11-story, blue-gray-brick building was developed by Cape Advisors Inc. and André Balazs, whose other New York properties include the Mercer Hotel and 40 Mercer Street, a residential project. Balazs also owns the Chateau Marmont in Los Angeles and the Raleigh in South Beach, Miami. Craig Wood and Curtis Bashaw are partners in Cape Advisors, a privately held real estate development, investment and management firm whose projects include the Congress Hall Hotel and the Virginia Hotel, both in Cape May, New Jersey, and the residential conversion of the former Electric Circus nightclub site at 19-23 St. Mark's Place in the East Village. Part of this development includes a six-story building on Crosby Street that has loft-type apartments, one to a floor, while the larger Lafayette Street building has apartments of varying sizes. This building is across Kenmare Square from the wonderful Storefront for Architecture retail space that was designed by Steven Holl and Vito Acconci in 1993. The Kenmare Square building obviously is chuck full of good ideas that are a bit tarnished by the rather drab color of the facade. In 2009, Kenmare Square underwent a restoration/improvement, but the surrounding context here is less than dazzling.